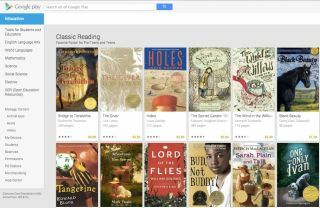 Google Play for Education announced today a new aspect of their content distribution strategy—digital books. Following the teacher friendly “pick-your-own” app and video announcements last fall, the company has partnered with several publishers, including Houghton Mifflin Harcourt, Harper Collins, Penguin, and Random House, to offer a virtual library service. Students are lent access to digital books for a set period of days during the course of the semester through a reader app—you can play with it here. When the course is over, the books evaporate. According to Google, a few beta schools will begin using it immediately with others starting over the next few weeks. Several other announcements concerning hardware: Toshiba, Lenovo, Dell, and LG all have new Chromebooks available this spring. Samsung’s newest Galaxy tablet is also Play friendly. Finally, the company unveiled a new site aimed to help educators figure out to best use all these tools. Look for Tech&Learning advisor reviews soon! For more details, click here.